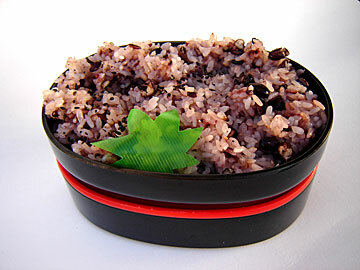 The red bean-rice dish called sekihan is prepared for special occasions such as New Year's in Japan. The traditional dish combines azuki beans and mochi gome (sticky rice) or a combination of mochi gome and regular rice. It is customary to serve sekihan with a sprinkling of sesame seeds. The dish can be eaten hot or at room temperature, along with other New Year's delicacies such as ozoni (mochi soup), nishime (vegetable stew) and of course, sashimi. Prepared sekihan is available at Asian specialty stores such as Marukai, Daiei and Shirokiya -- or try your hand at cooking the dish using a recipe from the Electric Kitchen on Page D4. Technically, the Japanese New Year doesn't begin until a bowl of toshikoshi soba, or "year crossing noodles" is eaten on the eve. It's a must-have dish to ensure good health for the year and a long life in general. Soba, or buckwheat noodles, is a common, everyday dish in Japan with a long history. Buckwheat was introduced to Japan from China and the noodles were probably popularized somewhere in the late 16th century. Soba noodles are grayish, with tiny specks. They have a nutty flavor and can be eaten hot or cold, but toshikoshi soba is a hot dish. 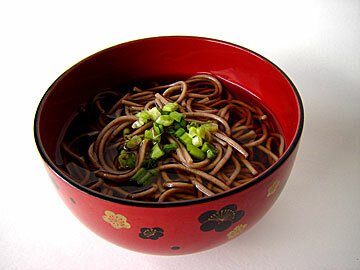 Soba noodles are also considered nutritious and rich in B vitamins, iron and calcium. Both fresh and dried soba noodles cook very quickly. Fresh noodles need only a minute or so in boiling water, whereas dried noodles may take five to eight minutes. Immediately rinsing the cooked noodles in cold running water prevents further cooking and creates a firm, chewy texture. Soba is easy to find at Asian markets such as Daiei and Marukai, with a wide price range. Send items to Eleanor Nakama-Mitsunaga, 7 Waterfront Plaza, Suite 210, Honolulu 96813. Or e-mail; elnm@earthlink.net.